The microFlash 4t Wireless, the Windows -compatible portable printer generates a full four-inch-wide (104 mm) printout utilizing multiple fonts and sizes, barcodes, custom logos, graphics, and signatures. The microFlash 4t Wireless, the Windows -compatible portable printer generates a full four-inch-wide (104 mm) printout utilizing multiple fonts and sizes, barcodes, custom logos, graphics, and signatures. It operates easily using wireless input and flash memory for simple updates in the field. It activates when data is sent and automatically goes back to sleep when not in use. The microFlash 4t Wireless also comes standard with IrDA-compliant wireless infrared communications technology. Data can be sent from a handheld computer from up to three feet (one meter) away, without any cables to get tangled or damaged. 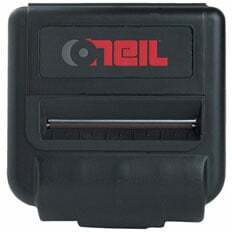 The Datamax-O'Neil 200370-100 is also known as ONE-200370100	or 200370100	.